How could I, as a thesp, confirmed fan and frequent quoter of Bruce Robinson's seminal film, Withnail and I, resist this biography of the man widely regarded as the main inspiration behind the character brought so vividly to life by Richard E. Grant? I couldn't. His friend, Colin Bacon, decided that there was a story to tell about Vivian Mackerell, an actor who never achieved the fame which at one time looked inevitable and instead became a slave to the alcoholism that eventually caused his death. That summary makes it sound like a depressing tale but Bacon is keen to unearth the stories and personalities in his glorious past, a time when he and the group around him seemed capable of achieving just about anything, but got nicely distracted along the way. 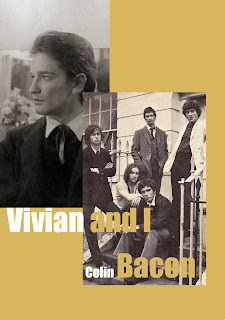 Bacon's approach is suggested by his choice of title, along with Viv's life we will read of Bacon's own. A story witnessed through the eyes of another Baby Boomer and placed strategically to move it along. It's true that the latter part of Vivian's life was largely taken up with drinking and at times, therefore, there is a need to reveal aspects of my own life that possibly might add an insight or two. 'Might possibly' is a good indication of the self-deprecating streak that runs throughout most of the book. Bacon is almost painfully lacking in confidence for his task. In the early chapters especially when he talks of his dreams of meeting famous people, his old wish to be an actor, his worries about being taken seriously, even jokes about sexual under-performance, I felt myself worrying that this was going to be a book written by someone on the periphery, attaching himself to the cachet of Withnail's success. Bacon of course is aware of this and the opening pages, in which he describes the early stages of writing the book as we read it, are as much about earning our trust and respect as the people he attempts to contact about Vivian. He doesn't get off to a great start with Bruce Robinson himself. Withnail has always been something of a millstone around his neck and his concerns about a book that was going to frame Vivian as the creative inspiration for it restrict his involvement in the enterprise to a few photos and contacts. Bacon slowly warms to the task and it is when we get to see Vivian attending Central School of Speech and Drama, forming the first memorable friendships, that we begin to get closer to the figure of legend. By his own (self-deprecating) admission it is David Dundas who really livens up proceedings with his descriptions of life at 127 Albert Street. The slightly dilapidated house in Camden Town, bought by Dundas' father for £6000 as a pad for his son during drama school, becomes the centre of student migration. At the core was Dundas, Bruce Robinson, Michael Feast and Viv but there is a constantly shifting entourage and assortment of 'itinerant girlfriends' which some nights included 'most of the cast of Hair.' There are flashes of scenes from the film particularly with the excessive drink and drug intake (I've seen joints that resemble television aerials and space stations coming off the production line. You practically gave yourself a hernia trying to get them to draw, but they looked great.) and there's no doubting the filthy glamour of 60's London, the only place to be at the time. I was a shabby drama student myself once upon a time and can relate to the impervious bubble of confidence that can build around you. Towards the end it feels like you're capable of anything and it must have been the same for Viv too. With talents like Feast, Michael Elphick and Robinson all doing well, the latter jetting off to play Benvolio for Zeffirelli's film of Romeo and Juliet (which would provide the inspiration behind Uncle Monty's sexual pursuit of 'I'), it might have been expected for Viv to follow a similar trajectory. There are conflicting reports as to whether Viv was any good as an actor. Some describe him as sensitive and charismatic, others as underpowered and lazy. He certainly doesn't seem to have had the ability to apply himself. Many actors aren't even aware of why they're good or what they do well and it seems that Viv's great skill was more as a raconteur rather than an actor. Bacon describes with great affection his ability to build a crowd around him at the bar and keep them entertained as long as the pints kept stacking up next to him. In a similar way Dundas cites the very qualities that made him such a valued member of the group. In a way I think his life peaked in the mid sixties when we were all at Central and there was so much fluidity and promise, and later he became stuck with the soul of that time and never managed to replace it with anything equally fecund...He had a knack of leaving the table just before the bill came, but returning to it to provide energy and entertainment and laughter for the rest of the night, and he was to a few of us in that place at that time one of the dearest and most missed friends that we will ever have. If the first few chapters are bit of a lame beginning and things liven up mainly when others begin to speak about Viv then Bacon really hits his stride when describing the life that came after that nucleus dispersed and people began to grow apart. It is as if the process of writing the book has helped him gain confidence, as well as the fact that he comes to write about the period when he and Viv were so close. The book actually becomes incredibly moving in a sad sort of way as we become party to the decline of a man through self-abuse and the powerlessness of his friend to steer him onto a safer course. There are of course some great lines too, to provide an insight into the repartee for which he is famed but which there has been little evidence of in the book so far. The success of this final section makes good on the shortcomings of the approach in the first half, and the brutal honesty accorded to Viv's final years gives the book a powerful finish. When seeking to understand the drive of a man so hell bent on destruction there is an interesting insight from Richard Digby-Day, the theatre director who remained so loyal to him as an actor, giving him frequent opportunities on the stage, and who always had faith in his abilities. He had a strange poetry about him. He reminded me of something like Shelley must have been like and of course Shelley had an anarchic personality. When I look back now I see the person that Vivian was most in love with was, in some weird way, himself, but he also hated himself. After reading this book it's difficult not to wish you had the opportunity to share a drink or five with the man himself, a wish impossible to grant now but this book being the closest you could come to it. I haven't read Robinson's novel, Stu, although I'm guessing the dialogue in it is pretty good.